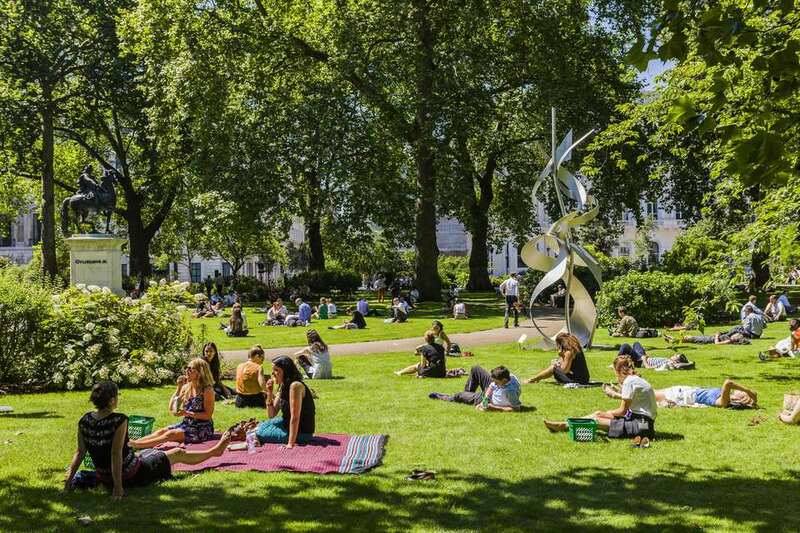 While the weather may be unpredictable, that doesn't keep tourists or locals from enjoying the last of summer in London each August. With several annual and ongoing events taking place throughout the month, there's no shortage of things to do on your trip to England this year. Peak tourist season happens earlier in the summer, but you should still expect large crowds near popular tourist destinations and at the free music concerts and movie screenings throughout the month. However, don't let the crowds keep you away—you might just miss the biggest street festival in Europe, the Notting Hill Carnival. July and August are the warmest months of the year for London, especially with the high humidity expected for the city, but there can still be plenty of rainy and overcast days that will bring temperatures down. The city experiences an average high and low of 73 and 53 degrees Fahrenheit. While not quite as sunny as June, you can still expect an average of six sunshine hours a day throughout most of the month. London is also rather humid in August, with an average high of 95 percent and an average low of 62 percent humidity. To best prepare for the volatile weather of London in August, the best thing you can do is pack clothing that's lightweight but versatile. While some days can reach up to 91 degrees Fahrenheit, which will require shorts, T-shirts, and sunglasses, chillier nights and wet days might require a light jacket, raincoat, or umbrella to keep you dry and comfortable. You should also wear close-toed shoes, especially if you plan to do a lot of walking around the city. From tours of the United Kingdom's Parliament to a multi-day beer festival, the event calendar for August is full of fantastic celebrations of the culture, history, politics, and people of London. Ongoing events include The Proms, cricket test matches, the Coin Street Festival, Opera in Holland Park, the Royal Academy Summer Show, and a chance to see the BP Portrait Awards at the National Portrait Gallery. The most popular and well-attended event is the Notting Hill Carnival, which takes place on the last Saturday and Sunday of August. This colorful celebration of London's Caribbean communities dates back to 1964 and features live music, dancing, vibrant parades, steel bands, and classic Caribbean street food including jerk chicken and fried plantains. Summer Opening of Parliament: During the parliament's summer recess, U.K. residents and overseas visitors can buy tickets to tour the historic houses of Parliament from August to September. Summer Opening of Buckingham Palace: Peek inside the Queen's London residence and explore the State Rooms, the Queen's Gallery, and the Royal Mews all month long. Great British Beer Festival: This celebration of British beer takes place at Olympia from August 7 to 11, 2018, and showcases over 900 real ales, ciders, and perries. Carnaval del Pueblo: This annual festival takes place in Brockwell Park in southeast London and is Europe's largest outdoor Latin American event, which takes place Sunday, August 5, 2018. Camden Fringe Festival: Launched in 2006 as an alternative to the Edinburgh Festival, this annual arts event runs for four weeks and takes place across a number of eclectic venues in Camden, London. London Mela: This free one-day event is a celebration of Asian culture, creativity, music, and food at Southall Park on August 18 and 19, 2018. Football Season: The football (soccer) season runs from August through May, so you can catch one of the first games of the season for teams like Arsenal, Chelsea, and West Tottenham Hotspur. Kid's Week at West End Theatres: During the last two weeks of August, you can take the little ones to the West End and enjoy free tickets to see some of London's top shows (with adult admission). South West Four Weekender Music Festival: This annual dance music festival takes place on Clapham Common on Saturday and Sunday, August 25 and 26, 2018 (the Bank Holiday weekend). Fright Fest: A fantasy and horror film festival showcasing the latest of independent and mainstream scary movies from August 23 to 27, 2018. July and August are the busiest months of the summer tourist season, so you should book your flights, dinner reservations, West End tickets, and accommodations in advance to avoid higher prices and sold out venues. The United Kingdom celebrates a bank holiday on the last Monday of August, which falls on August 27, 2018. Federal buildings, banks, and some offices and businesses will be closed, but tourist destinations, food and hospitality services, and most shops will still be open. Since the Notting Hill Carnival, Bank Holiday, and South West Four Festival all happen at the same time, the last weekend in August would probably be the best time to visit—but also the most expensive.